A modification to make the result of events more evident and transparent. I haven't added notes to all events, only for critical events. Last edited by ValdorianAlt2 on Thu Mar 31, 2016 6:06 am, edited 1 time in total. 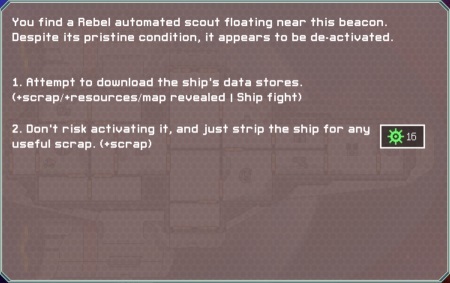 The next issue is in the event "The Engi Virus" (http://ftl.wikia.com/wiki/The_Engi_Virus). The note at the blue option warn you that you will lose an Engi crewmember, but I didn't wrote that you get "Virus" with full skills after the fight which makes the blue option the best choice. I'll upload a new version in the next days, which will fix it. When you notice more problems, please tell me, so that I can fix that too. Don't you think this mod is kind of redundant? Most people who still browse this forum and play this game are seasoned veterans by now. As well as this taking a lot of the fun out of early game experiences for new players. Having trouble with the Slug cruisers? Try my guide! MC3craze wrote: Don't you think this mod is kind of redundant? Most people who still browse this forum and play this game are seasoned veterans by now. As well as this taking a lot of the fun out of early game experiences for new players. New player shouldn't use this mod (well, it's their own decision), and it's just a comfort function for veteran players. I made this first and foremost for myself, but I see no reason why I shouldn't share it here. I like it. 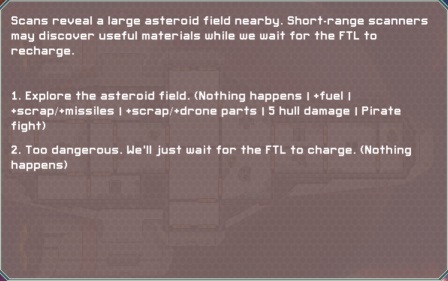 I've been playing FTL for over 2 years and I still can't remember what every event does. I used this mod in an upcoming episode of my LP series, and it actually helped me remember something so kudos to the author! When you are accepting a quest, a tip about prepping for the eventual quest end would be useful. For example, "You may want L2 doors before completing this!" Can I make a request? Can you make a version of this that only details specific actions? For example, when there's an event where you have to give up a crewmember (Like slavers demanding one of your crewman), can the event specify which crewmember has to leave, by name and race? I don't want all the parts of this mod. I don't want to now what each event will specifically do, I just want to be able to make more informed decisions when it comes to crewmember tradeoff moments. And for events where it says "Welcome him aboard" to a new crewman but doesn't specify what race said crewman is, I'd love it if the event did specify it. Klokinator wrote: Can I make a request? Can you make a version of this that only details specific actions? 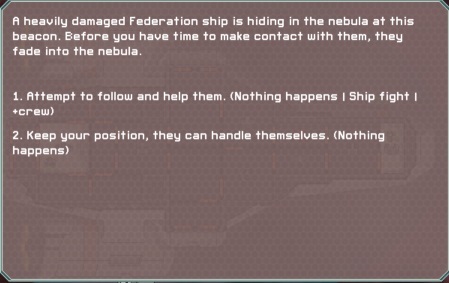 For example, when there's an event where you have to give up a crewmember (Like slavers demanding one of your crewman), can the event specify which crewmember has to leave, by name and race? 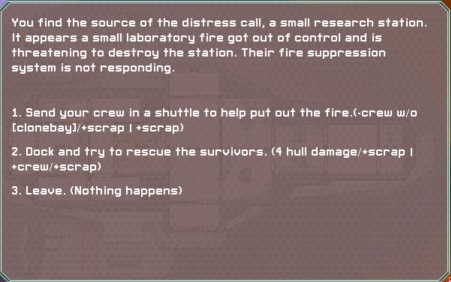 Not possible via game mechanics BUUUUTTT... it is possible to tailor a crew loss event specific to the alien. 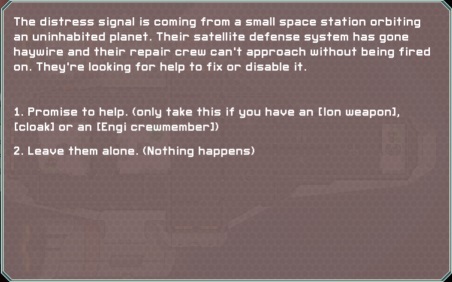 There is an event where you can have your Lanius crew help a construction crew out and the Lanius is lost specifically. 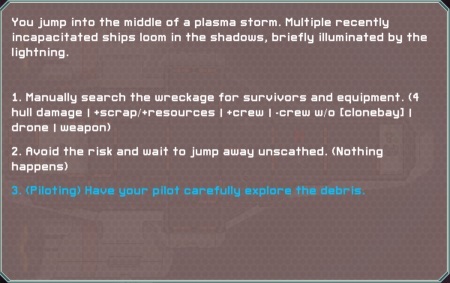 So what could be done is that if given a choice to lose a crew, it can be decided via blue event. "Hand over the Human" "Hand over the Mantis." If you have more than one, you might lose the important crew, but at least you're not losing your Crystal to space BS. Why modmakers haven't done that yet? Probably because it's a huge undertaking to make specific losses for all events. But it'd be nice to only lose the foolish meatsacks during a plague because you swapped out the medical facilities for a cloning facility. I'm still fairly new to the game but I believe I've found a bug with this mod related to the Ancient Device quest. I found the stasis pod. I took the damaged stasis pod to the zoltans to get scanned, Ruwen popped out. I looked around to see if I was able to sell this damaged stasis pod augment now that I have the person out, and still be able to complete the quest. It seems that the pod was supposed to be removed from my ship automatically though? Going to keep and see if I can get another Ruwen, but it would still be extra scrap you weren't supposed to get so probably worth looking into?